The end of the 2008 season is approaching! The DCI Fan Network is one of the best places to get all the latest videos from corps as they compete during World Championships week. The reduced subscription price of $39 includes Live Webcasts from the Open and World Class Semifinals and just-added OnDemand video from both nights of the DCI Eastern Classic in Allentown, Pa.! Brush up on everyone's latest changes, hold on to your hats and check out even more of the exclusive Fan Network offerings from the past week below... Visit the DCI Fan Network. The Academy Who needs to take a morning run when you could shadow-box instead? The Academy drum line gets amped up for the day ahead in a "Life on the Road" video. Blue Devils Snack time with the Blue Devils means that the food is going, going, gone! 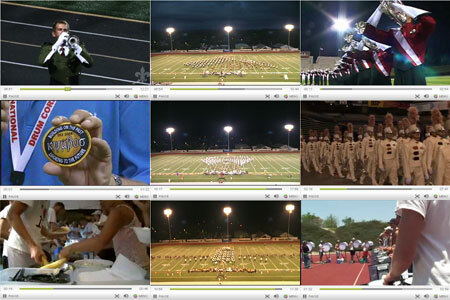 Fans can check it out in a time-lapse video on the Blue Devils Fan Network. Blue Knights The latest in the post-show podcasts from the Blue Knights covers the corps' performance at the DCI Eastern Classic in Allentown, Pa.
Blue Stars "Blue Stars in Motion #13" finds the corps in West Virginia, or was it just regular Virginia? Inquiring minds want to know. Bluecoats "Bluecoats Live Minute 2.10" features the percussion section rehearsing sections of the corps' program. The Cadets A quick interview with Field Pass host Dan Potter in Atlanta features Chris Castille, drum major for the Cadets. Carolina Crown Inside, outside and all about, Carolina Crown took San Antonio by storm in "Crowncast #6." Crossmen Dan Potter caught up in Atlanta with the Crossmen's staff cymbal tech, who's leading a movement to revive marching cymbal lines. Glassmen Who doesn't like fun? The Glassmen love fun so much they made a whole video about it, and put it on the Glassmen Fan Network. Madison Scouts Coffee is for the weak! Drum corps fans can kick off their morning with a hearty dose of the Madison Scouts, straight from their Centerville, Ohio encore to the Fan Network. Santa Clara Vanguard The Santa Clara Vanguard's encore in Salem, Va. featured the corps' classic "Send in the Clowns." Fans can hear it on the Santa Clara Vanguard Fan Network. This week is your last chance to get in on the Live Webcasts from the Open and World Class Semifinals, but the even lower Fan Network subscription price of $39 will keep you humming into the off-season with OnDemand post-show replays from contests this season, exclusive World Class corps content, and DCI audio and video archives back to 1972! The DCI Fan Network is the next best thing to having your hair blown back and your teeth rattled by your favorite corps, in venues across the country. Subscribe to the Fan Network today.